Tony Blair insisted that the Iraq war was still justified despite there being no weapons of mass destruction during interviews on Wednesday. He told BBC Radio 4's Today programme that he'd only done what any "reasonable" prime minister would have. Leader of the House of Commons, Peter Hain answered your questions in a live interactive forum. In his address to the Labour Party conference the prime minister urged Labour to put aside its differences over Iraq and seize the chance of an historic third term in power. What did you think of Tony Blair's speech and interviews? Have they made a difference to your view of his government? From Blair's words on domestic issues you would think that they have been in opposition for 7 years. These are the same promises they made in 1997; where have they been for 7 years? Why have they not already tackled all the issues he raised today? Health, Education, Transport, these were on the cards when they came to power in 1997! Problem is, what opposition is there? Hopefully the Liberals can form an opposition and provide some much needed parliamentary checks and balances. Blair delivered an impressive speech and thrived on the confrontation with protesters. Pleased to hear the government intends to help first time buyers; thought he missed the point over Iraq. I objected to the war not because I liked Saddam Hussein but because I disagreed on the grounds we went to war. We all accept Iraq has been difficult, but at least we can stand up and say Britain is a country with a leading role on the World stage. Saddam ousted, Iraq finally has a choice to be free, to have an opinion, to not fear for their lives from one day to the next. We face challenges, but we also face a choice, and I'm proud Britain will not stand by and watch such acts of hatred and terror. Blair has shown courage, a quality much needed when leading a country. Good speech, good delivery and a clear message. Sorry Tony. After many years of Labour support, and even with Jack Straw as my admirable MP, the only way available to me to demonstrate and protest at the appalling realisation that our great country has stooped to, in my view, an illegal war, is to vote against Labour. I would reconsider if Labour had a new leader. I only wish I had a chance to make a speech to Tony Blair. Why should we listen to him, when he quite clearly doesn't listen to us. The anti-war protest in London was the biggest demonstration of its kind in the history of Britain - not a word of it was acknowledged. I don't think he's listening to me, so I won't be voting for him next year. I will never trust a word Tony says again, least of all where our armed services are concerned. So he never bothered to find out the 45 min weapons they may face? Shame on him. I like the fact that he takes the credit for the country doing so well.... What about the hard work that WE have all put in? As a much Greater Briton might have put it, his speech was 'full of sound and fury but signifying nothing'. Tony Blair is a truly great Prime Minister and a remarkable world statesman. Long may he remain in office with the Labour party in government. I've been politically aware since 1954, have seen them all come and go. This lot are the first to really impress me. He talks about democracy but his contempt for Parliament and use of spin tell another story. We have the words but where are the results? Maybe TB does believe these things, choice and opportunity, but the Labour party doesn't and never has done, it is rife with envy, class hatred and a nanny nature. They do not understand what true freedom means. A politician's words are like the perfect roast tatty. Take them with a pinch of salt. I've noticed that many posters on this board are backing Blair basically because he is the "least worst" of the alternatives. A ringing endorsement indeed. Re Matt C Scotland: Blair the least worst of alternatives...Very true and deeply depressing. I've never felt so disenfranchised in my life. I was quite impressed by the speech and the way he handled the disruptions. He has a clear idea of where he wants this country to go on just about every issue. I admired his boldness about Iraq and other issues. Whether people agree with Iraq or not is irrelevant now because we are there, and have been there for over a year. The real question is what should be done to stabilise the situation so our lads can come home sooner and the Iraqi people can get on with their lives in peace. Tony Blair still seems committed to resolving the situation unlike some that are still just arguing over whether it was right or wrong - the fact is that time has been and gone and all the arguing in the world is not helping the situation, our lads or the people of Iraq. I find it interesting that, though there are many posts here that say Blair should be gone, there's no mention by even the most antagonistic writers of another name to take the charge. Thanks you Prime Minister. You have differentiated the minority bad element among Muslims from the peaceful majority. You have called our faith "honourable". You have made my day. Thank you so much. Blair says he is not sorry for removing Saddam which is very noble of him. What about the leaders of other regimes around the world? Burma and Zimbabwe come to mind. Any action in Darfur Mr Blair? When he says he made a mistake read mislead. And now he is sorry that will make everything just dandy! I think it's a disgrace that the guy can't make a speech to his party without being interrupted by people protesting against what he has to say. Where are people's manners? If you don't agree with the man's values, just vote him out at the next election. If Mr Blair's comments about Iraq came shortly after we invaded, then perhaps he deserved a second chance. However, he's only apologising now to win voters. He's not getting my vote. If this speech had been made seven years ago I'd have hailed it as a great view of the future and welcomed its optimism. Today I look at it after broken promises and an unjust and dishonest war. Blair has made me (and I'm sure many others who cheered his election) disillusioned and disappointed. We deserve so much more than these empty, meaningless words. He may be a good speaker, but he misled the UK voters re the reasons to invade Iraq, as Bush did with the American public. I cannot forgive him this error of judgement. He should step aside, and let someone else pick up the pieces. The problem is that the Iraq controversy has caused such anger and disgust amongst voters it will simply not go away. What makes it worse is when Mr Blair tries to wriggle out of it by putting the emphasis on removing Saddam Hussein. If that had been the reason for war, neither Bush nor Blair would have got involved. Mr Blair could have won back some support by showing genuine contrition. Instead he just seems to dodge the issue, and the gulf between him and the public seems just as wide as ever. I find it almost impossible to believe that anyone is still taken in by Tony Blair. His speech was full of vacuous sound bites and the overall tone was horribly smug. I sincerely believe - and according to Blair sincere belief is all - that the man is not playing with a full deck. Blair is absolutely right to strenuously deal with issues that affect Africa such as HIV/Aids, corruption and poverty before they catch up with the UK. Good speech, but I am afraid that no matter how well dressed the words are, I have simply stopped believing them. The man no longer has any street cred for me. He is not a good leader, he is a good speaker, there is a huge difference between the two. Blair's speech writers should be congratulated! Blair's speech writers should be congratulated! Blair himself should be congratulated for maintaining semblances of trust - even after the Iraq episode. Incidentally I feel it was a mistake to not apologise sooner for the intelligence failings. Am I the only one who sees the abject failure by the Labour party in almost every policy area from transport to education to health and more? The argument that the economy is booming under Labour does not stand if examined closely. We have the almost the highest level of house prices in the world financing the highest level of personal borrowing in the world that has kept our economy afloat not Gordon Brown's economic policies. Heaven help us all if they are elected for a third term. I, for one will not vote for them. The world welcomes Blair's apology on Iraq, but he is yet to convince us that Iraq is any better. His exit plan is not clear. Brilliant speech from a brilliant leader. The country has been better off under the Blair government. Difficult decisions have to be made by politicians of all parties. Thank goodness that the PM and our government do so from honest conviction. Let's look forward to the next Labour government and not back to the failures of the Thatcher years. The reason I will not vote Labour again is simply because I cannot afford to. Higher fuel tax, council tax, national insurance - stealth tax after stealth tax .Over 60 tax rises since coming to power. My pay rises by about 3%, council tax by over 12%. My disposable income is reducing year after year. I cannot afford any more Labour stealth tax. How Tony Blair could have had the nerve to mention pensions is beyond me. In 1997 we had a pensions system that was the envy of the world. Today it is in chaos, thanks largely to his government's policies, and he has betrayed not the slightest hint that he has any idea what to do. We are very lucky to have Tony Blair as Prime Minister. I am proud of each decision he has made. He is a strong leader, and we should back him instead of continually pulling this man to pieces. Carry on with the good work Tony - we need you. You simply cannot put the Iraq issue to one side. And it was not just Blair himself. Blair and his central players misled the country and have made the world demonstrably a more dangerous place. What's worse, he will deceive again. How can we ever trust him on anything? I will never vote for him again - however poor the opposition. He and his party have deceived the country for the last seven years. Over Iraq, over promises not to increase tax, over promises to improve the NHS, Education etc etc. Do people really believe what he is saying now, or even believe that he believes it? A good speech which focused on so much that matters to the British people. Whether or not Iraq was a mistake is simply debatable because without the invasion Saddam would still be in power, sanctions still in force - and we now know that if the pressure on Saddam had diminished then he intended to restart his WMD programme. Blair is avoiding the real issue. Nobody has any nostalgia for Saddam, but the instability and chaos caused by Blair and his boss Bush in invading Iraq has unleashed a hornets nest of terrorists in Iraq. Invasion of Iraq, whether you agree with it or not, has demonstrated that Tony Blair has resolve and determination. He is not one to avoid difficult or potentially politically damaging decisions. He is not an appeaser, and has strategic vision in these dangerous times. Let's hope we don't let our desire for change welcome in a party that would risk our security through weakness and fear. Blair highlights the performance of the UK, yet he ignores Scotland. Scotland would benefit from the Euro, more powers at Holyrood and abandoning the Barnett Formula by which he is fleecing us. It's time he brought in radical yet democratic change before he loses the support in Scotland to the SNP. What? No mention of the EU Constitution? There were no WMDs, no evidence that Saddam had links with al-Qaeda, no involvement in 9/11 attacks, the invasion was illegal as described by head of UN, in international law it's illegal to attack to change a regime, the intelligence was very poor i.e. the 45 minutes remark - among many and Blair feels that he still did the right thing in his hearts of hearts - this beggars belief. Step aside Tony and take your anti-hunting brigade with you! Blair is wrong to say that although the reasons given for going to war were bogus it was the right thing to do. We were told that we had to go to war, such was the threat from Saddam. If Blair is to cite Saddam's human rights record as justification then why is he not similarly decisive in acting against all the other hateful regimes around the world? The man is quite unbelievable, how he can stand up there and address the nation admitting that our own Labour government lied about the Iraq war, and then go on to say that he's going to lead us for another term... delusion is the politest word that springs to mind! Fair do that Saddam has gone, but he could have been taken out without the expense in human and monetary terms that we have to pay for. All I can say is I am glad that I wasn't old enough to vote last time around, this time I shall be using my vote! People needed to be reminded of just how far we've come since 1997. Mass unemployment is a thing of the past, and we've got many more teachers and nurses than before. Blair has kept those promises. In 1998, Tony Blair stated that the Child Support Agency had failed children, parents, and the taxpayer. He was correct. Unfortunately, six years later, his government has taken the failed scheme inflicted upon parents and children by the Conservatives and added its own which is operating even worse (it is an utter shambles). We now have two failing systems of child support and it is a national scandal. Never mind boring old Iraq and fox hunting - there is logic, albeit arguable - to the government's behaviour on these issues. You need dedicated incompetence; however, to do what has been done with the Child Support Agency. Thus, it is because of a failure to deliver on bread and butter issues like the reform of the CSA that I have resigned from the Labour Party and will not be voting for Tony Blair at the next General Election. I loathe admitting this, but I thought it was a first-class speech. Tony Blair is the only realistic choice to lead this country. Some of his decisions may have been unpopular with the banner-waving and slogan-shouting "masses" but then leaders have to take tough decisions sometimes. As for Michael Howard and Charles Kennedy, don't make me laugh! I see he is concentrating on domestic issues now the election is coming. I would rather he had done that all along instead of wasting time and my hard earned taxes with the Iraq war. The reason why we are in so much danger is because we got involved in it. He's ok, he has round the clock security. The rest of us do not. A wonderful speech. You can't run the country by public opinion and some hard decisions have to be taken. Tony Blair has the courage and conviction to make these hard decisions and not be deflected by those who shout the loudest. Mr Blair needs to notice the state of the country he is running, as well as the situation in Iraq which is becoming more dangerous every day, not only is immigration out of control, the NHS is under ridiculous targets which does not help to improve the problem, he also forgets that the countryside is a big part of this country. I'm sorry but a big speech does make me forget any of these issues. Those calling for Tony Blair to stand down either have very short memories, or are too young to have experienced the dark days of Thatcherism. The Tory Party know that the day Blair goes will mark the start of their return to electability. The Iraq war may be casting a shadow over this conference, but in the fullness of time Tony Blair will be recognised for the moral courage he demonstrated in dealing with a dangerous regime. Those who would choose the next government solely on the issue of Iraq clearly have little to worry about. Personally I'm more worried about saving for a pension, buying a house and hope that with rising crime and a struggling NHS I live long enough to enjoy them. Iraq is a long way away and can't be "un-invaded" anyway. Blair always gives good speeches and he is a polished minister. The sad fact is that despite all he says the Government has made Britain a very divided place. There is talk of banning this and that, new legislation, new laws and fines, surveillance and identity gathering. After seven years we walk into dark times. I hope the UK has the backbone to get through the tunnel it has voted itself into. This is not a time for celebration. Blair is a very good speaker that is not in doubt but his words are hollow and all his promises are never delivered. I am still waiting to see the improvements promised in hospitals, infrastructure and immigration amongst a few. Blair seems very sincere in his convictions and passionate about his vision. 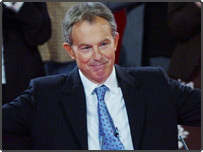 However, he is humble enough to recognise and acknowledge the mistakes of the past, mainly in relation to the faith placed on the Iraq WMD intelligence, and the short comings of some of Labour's achievements and consequently the need to continue to improve the quality of life for all British people in the next term. In all, a man and a prime minister with integrity. We are lucky to have him in these uncertain times. Urging unity and 'fairness for all' - whilst creating division, bitterness, job losses and resentment through anti-hunt legislation. People are in danger of letting their obsessive disagreement with Blair over Iraq blind them to the fact that he is a very good Prime Minister. If only we had an effective opposition party in this country then this man wouldn't be giving this speech. New Labour is good for the country, but Blair is not. He should have the dignity to step aside before their majority is significantly cut at the next election. Blair needs to realise that he is now damaged goods and he can't spin his way out of this perception. He should stand aside and allow Gordon Brown to lead Labour to win the next election. If only he listened to the people he'd be a half decent leader. The vast majority didn't want conflict in Iraq and the vast majority are against his countryside policy. If he won't listen to the public how can he be voted in again? Good speech or no good speech. Ok we are all annoyed with Blair for one reason or another. But come on, do we want any of the others to run the country? I think not. Mr Blair can make a speech that tries to put a positive slant on many of the fundamental flaws within his government, but the public only need to look at today's events in Iraq to see that he has failed to deliver on many of his key promises. He may not be the best, buts he's certainly the best option we have considering the opposition. Good speech. Although I disagree with Blair on the Iraq war, I must admit I hope he will be re-elected. As far as internal affairs are concerned he and his government did a great job for the UK. Tony Blair is a man with vision, an international statesman and the right man to lead our party to a historic third term. This speech shows exactly why people should vote him back in next year. I cannot understand how people can still support this man. He has cheapened British politics and diminished the international respect it one held. A few sound bites and a Tim Henman look of determination, does not a leader make. I know the Tories are pretty hopeless and the Lib Dems are a bit of a joke but we really can't afford to keep this man in charge. Mr Blair has said that the people have chosen the changes that he claims that his government has made. May I remind him that less than 42% of the 58% of the electorate who voted in the last election voted for Labour. He looked a bit tired after the summer recess but he appears to have regained his former strength. I personally support the Lib-Dems and his speech won't change that but I always enjoy listening to Mr Blair, he's a strong speaker and he deals with his audience well. I only hope he listens to his own advice and listens more in future to the views of the electorate. I don't care about the hunting debate, nor about Iraq. I care about the issue that affect me like taxes, NHS, minimum wage, the welfare state and jobs. All immeasurably improved since 1997. This party is the only party fit to lead this country. Truly inspiring. Britain is in safe hands. I've already made my mind up about which party won't get my vote next time - entirely due to Iraq. All the weasel words in the world won't make any difference. If it was not for Iraq, and various other foreign policy follies then I would probably be listening respectfully to Tony Blair. I can sum up in three words what really bothers the British public at the moment, Iraq, Iraq, Iraq. I hear the speech but I cannot forget Iraq. Mr Blair needs to convince the country that he is not the PM of the 51st state of the US. Removing the Bush-Blair connection from the minds of the public will go a long way towards convincing the voters that he has got Britain's best interests at heart. Otherwise the party is going to struggle in next year's election. Tony's speech will change my views about as much as the 2 million anti-war march persuaded him to listen to the people. The time he spent slagging off the opposition would have been better spent saying what he is going to do about the critical and important issues which matter to the British public. Absolutely brilliant! This is the man to lead the nation. Pity Mr Blair did not spend more time looking after home matters before today, now that there is an election due he discovers the home front again. Just because Blair 'believes' a cause to be right himself, does not make it right. Listen to the people or lose. I started to watch the speech, but it is impossible due to the constant flashing of cameras by the press. Mr Blair says we are lucky to live in a democracy where we can express our views. Why then was a hunt protestor physically evicted before he could do just that? Mr Blair is right, the Labour party needs to pull together at this difficult time. Wasting energy on in-fighting and politics can only serve to hand the country back to the Tories come the next election. His speech should have only 2 words: I resign. It does not matter what Blair says, very few people will believe him. Still it might get him a few brownie points with the gang of 'hangers-on' that surround him. Even the best speech in the world isn't going to gloss over the deepening quagmire in Iraq.